AUTHOR NOTE: This book is dedicated to all Teachers and Librarians. Thank you for sharing yourselves so selflessly. You are a unique and beautiful light that shines on the faces of our children everyday. 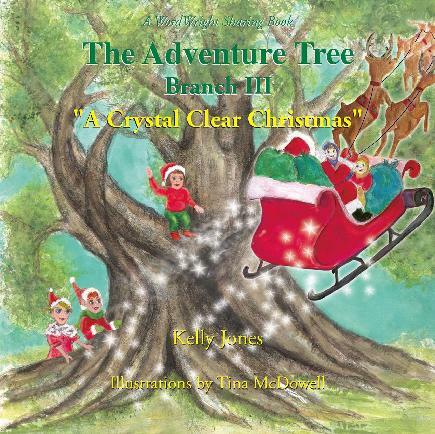 The Adventure Tree - Branch III: "A Crystal Clear Christmas"
WordWright.biz announces the publication of The Adventure Tree - Branch III: "A Crystal Clear Christmas" by nationally acclaimed author Kelly Jones. Join Willow and Zak on their holiday adventure. Travel with them to the North Pole.Meet Santa and his elves. Then make your own adventure. A Crystal Clear Christmas is the third in a series of books that follows Willow and Zak to places you never imagined...but can. Jones magically continues her world of wonder and excitement for children ages 3 to 8. Jones is constantly striving to find new ways to encourage and inspire children. Her latest book tackles teamwork and acceptance along with compassion. With each new story in The Adventure Tree series, children will experience new creatures and adventures that will captivate their imaginations. the common theme in each story will be the issues of daily life that kids deal with. The series continues to be fun and exciting but above all teach valuable life lessons that will help them for years to come. Continue the adventure with Willow and Zak to places you never imagined...but can! 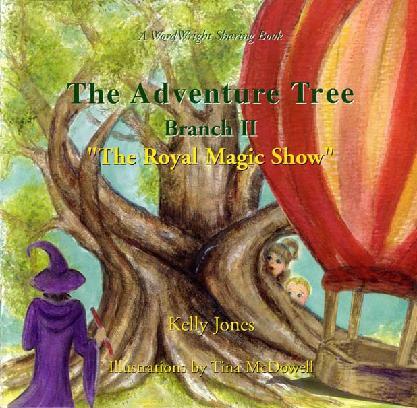 The Adventure Tree - Branch II: "The Royal Magic Show"
WordWright.biz announces the publication of The Adventure Tree - Branch II: The Royal Magic Show by Kelly Jones. Follow Willow and Zak as they embark on their newest adventure. Travel to a magical kingdom. Attend a royal birthday party. Then make your own adventure. The Royal Magic Show is the second in a series of books that follows Willow and Zak to places you never imagined...but can. Jones continues her world of wonder and enjoyment for children ages 3 to 8. Jones hopes for all children who read The Adventure Tree books is that they will want to share their gifts and talents with others. She hopes that children will plant seeds of kindness wherever their travels take them. With each new story in The Adventure Tree series, children will experience new creatures and adventures to captivate their imaginations. The common theme in each story will be the issues of daily life that kids deal with. The stories are fun and exciting but above all teach valuable lessons that will help them for years to come. The Adventure Tree - Branch II: The Royal magic Show is available to booksellers through the usual channels and readers may buy or order copies from their favorite bookstore, WordWright.biz, Amazon.com, B&N.com, Borders.com, Xlibris.com or other sites.